LABAlive presents LABAlive Two: Others on Thursday, March 16, 2017 at 7pm in the Theater at the 14th Street Y for an evening of literature, dance, theatre, and subversive teachings exploring the theme of OTHER. The evening will feature teachings by LABA Scholar Ruby Namdar and works-in-progress by LABA fellows Hadar Ahuvia, Abigail Katz, and Gordon Haber. Experience the power of ancient text through a modern lens as the fellows question, challenge, and make meaning through new, provocative art. This unique evening blends artistic disciplines with wine, nosh, and learning for a truly special event. The LABAlive series consists of three performances, each showcasing the work of the LABA fellows. LABA: A Laboratory for Jewish Culture is a program of the 14th Street Y that uses classic Jewish texts to inspire the creation of art, dialogue, and study. Part of LABA is the House of Study, an artist fellowship program in which a group of artists from various disciplines are brought together to study classic Jewish texts in an open minded, non-religious setting. These studies inspire work which is featured in the LABAlive events series and on labajournal.com. Each year's LABA studies are focused around a specific theme. This year's theme is OTHER. Previous themes include Paradise, Eros, Blueprint, Eat, Mother, and Time. LABAlive Two: Others melds together literature, dance, and theater with presentations by Gordon Haber, Hadar Ahuvia, and Abigail Katz, respectively. Gordon Haber, author of novellas False Economies and Adjunctivitis, will read from his new book Uggs for Gaza and Other Stories, a collection of stories that investigate themes of displacement, otherness, and silly Australian boots. 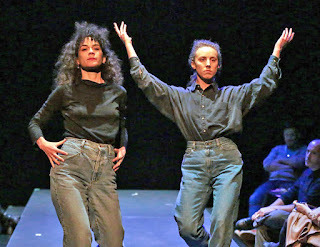 Brooklyn based dancer and choreographer Hadar Ahuvia (New York Live Arts, EMPAC, Dixon Place, CPR, Danspace Project's Draftwork) will present "Everything you have is yours?" This piece deconstructs instructional videos of Israeli folk dances to uncover the Arab origins of Israeli identity. Finally, Abigail Katz (Atlantic Theatre Company) will present Route One, inspired by Roger Kamenetz's The Jew in the Lotus, which follows the journey of two American friends who join a group of Jewish spiritual leaders visiting the Dalai Lama to discuss exile. These presentations are woven together with teachings by Sapir Award winning scholar Ruby Namdar, focusing on the theme of Other. For more information about the fellows, projects, and LABA: House of Study, visit labajournal.com. Interested in a 14th Street Y Membership? Our members have access to more than 50 fitness classes per week, lap and family swim times, childcare, pick-up games in our basketball gymnasium, and a fitness center filled with a full range of cardio and weight equipment.